Apple Card Review: Is It a Rewards Game-Changer? Apple plans to release a rewards credit card this summer that’s a step up from its current rewards card and a contender to dominate the rewards credit card game—among Apple users, that is. The card, issued by Goldman Sachs, reserves its best rewards for Apple purchases and transactions made using Apple Pay, which makes it less of a physical card than it is an incentive program for using Apple’s proprietary technology. But if you’re among the Apple faithful, it’s worth keeping tabs on Apple Card details as they trickle out. 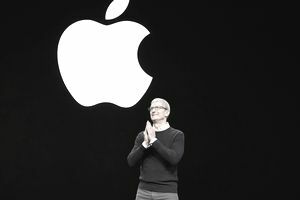 The company gave a vague launch timeframe—summer 2019—and asks interested customers to sign up for Apple Card updates via email. Here’s a review of what we know about the Apple Card so far. This card does not offer a sign-up bonus or an introductory APR for purchases or balance transfers. The company has not specified a recommended credit score for this card. The Apple Card doesn’t offer a sign-up bonus, according to preliminary information the company has published ahead of the card’s release. Apple Card does not limit the amount of Daily Cash you can earn, but the website says nothing about whether or not Daily Cash expires. Daily Cash accrues on your Apple Cash card, which you can then use on anything that accepts Apple Pay. Users without an Apple Cash account can opt to have Daily Cash applied as a statement credit. Maximize rewards by redeeming Daily Cash as a statement credit. Using Daily Cash via Apple Cash means you’re not earning rewards on those purchases, when you could get 2% back using Apple Card with Apple Pay. Numberless Credit Cards: Both the physical and virtual Apple Cards have no numbers on them. For non-Apple Pay transactions on apps or websites requiring a card, the Wallet app or Safari web browser autofills a virtual card number. Face ID and Touch ID: Use Apple’s Face ID and Touch ID technology when making an Apple Pay transaction. Integrated Map Data: Tap a transaction you don’t recognize to pull it up in Maps and see where it occurred. Text Support: Text questions or to receive help with your account. Budgeting Tools: Apple Card breaks down your spending by category. Credit Card Debt Tool: You can play with an adjustable slider to see how much you pay each month affects how much interest you owe. Apple card does not charge a penalty APR, returned payment fee, cash advance fee, or overlimit fee. Late or missed payments, however, will result in additional interest accruing on your balance. Apple has not provided details about a cash advance APR. If you’re not an Apple user, don’t bother, but if you are, the Apple Card could be a great (but not the best) way to earn 2% cash back on most purchases. Apple Card is Goldman Sachs’ first credit card, so this is unknown territory, and the customer experience remains to be seen. But as Apple Pay enthusiasts know, it’s not a payment option everywhere. If you apply for this card, plan to keep the physical card on you. If you’re out for the rewards, keep an option with a rewards rate better than 1% at the ready, too. The company plans to make Apple Card available in summer 2019, and you can sign up for email updates on the Apple Card website. In the meantime, check out our roundup of the best credit cards for money back.